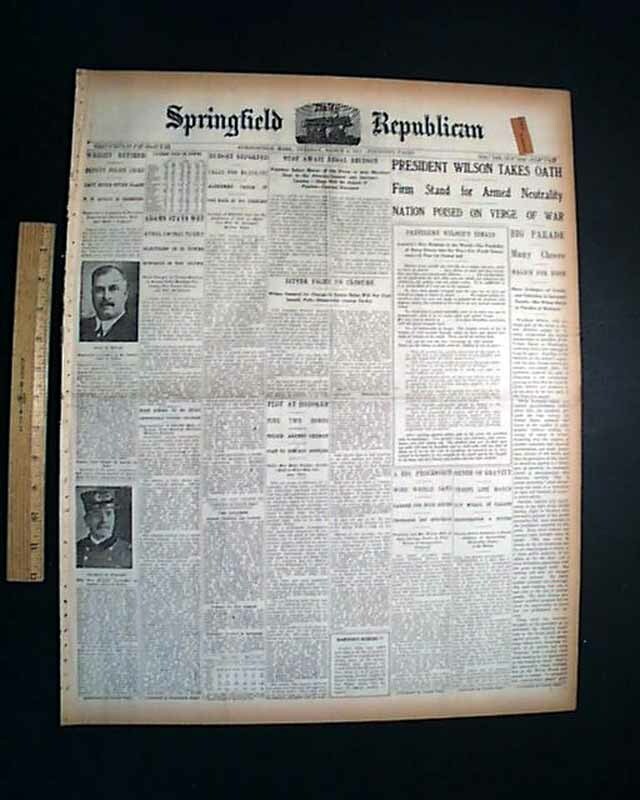 This 14 page has front page headlines that include: "PRESIDENT WILSON TAKES OATH" "Firm Stand for Armed Neutrality" "Nation Poised On Verge Of War" "Big Parade" and more. 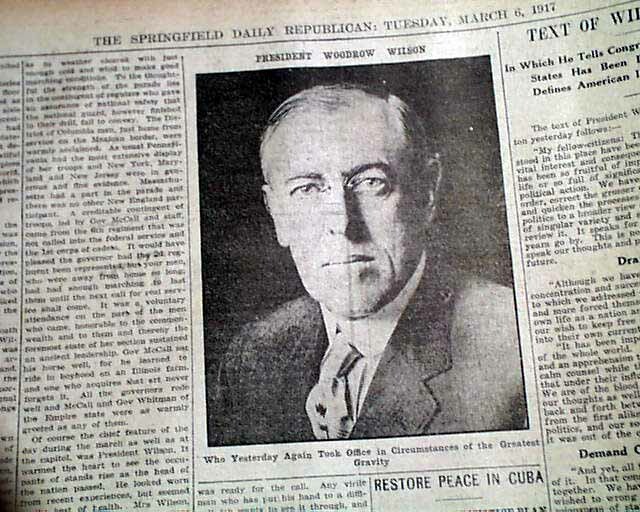 Continues on page 2 with nice two column photo of Wilson. Light browning with little margin wear, otherwise in good condition. Should handle with care. Narrowly re-elected in 1916, his second term centered on World War I. 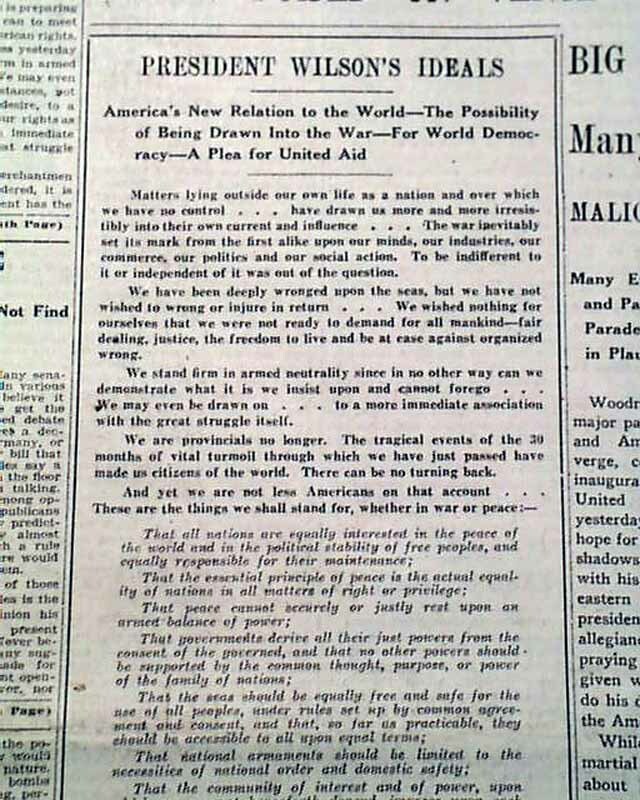 He tried to maintain U.S. neutrality, but when the German Empire began unrestricted submarine warfare, he wrote several admonishing notes to Germany, and in April 1917 asked Congress to declare war on the Central Powers. He focused on diplomacy and financial considerations, leaving the waging of the war primarily in the hands of the military establishment. On the home front, he began the first effective draft in 1917, raised billions in war funding through Liberty Bonds, imposed an income tax, enacted the first federal drug prohibition, set up the War Industries Board, promoted labor union growth, supervised agriculture and food production through the Lever Act, took over control of the railroads, and suppressed anti-war movements. He paid surprisingly little attention to military affairs, but provided the funding and food supplies that helped the Americans in the war and hastened Allied victory in 1918. 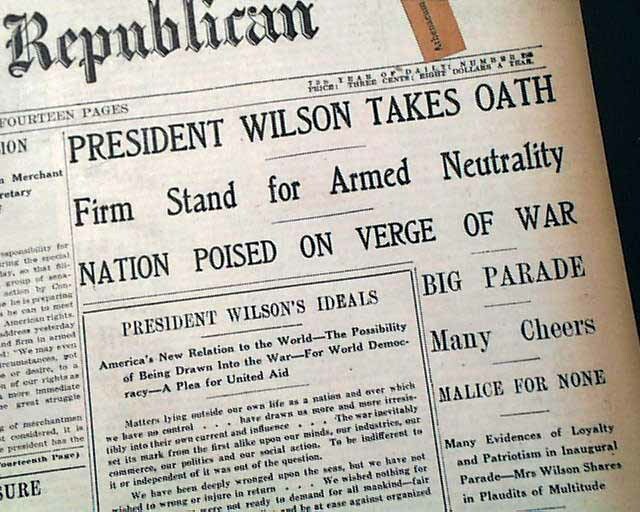 In the late stages of the war, Wilson took personal control of negotiations with Germany, including the armistice. He issued his Fourteen Points, his view of a post-war world that could avoid another terrible conflict. 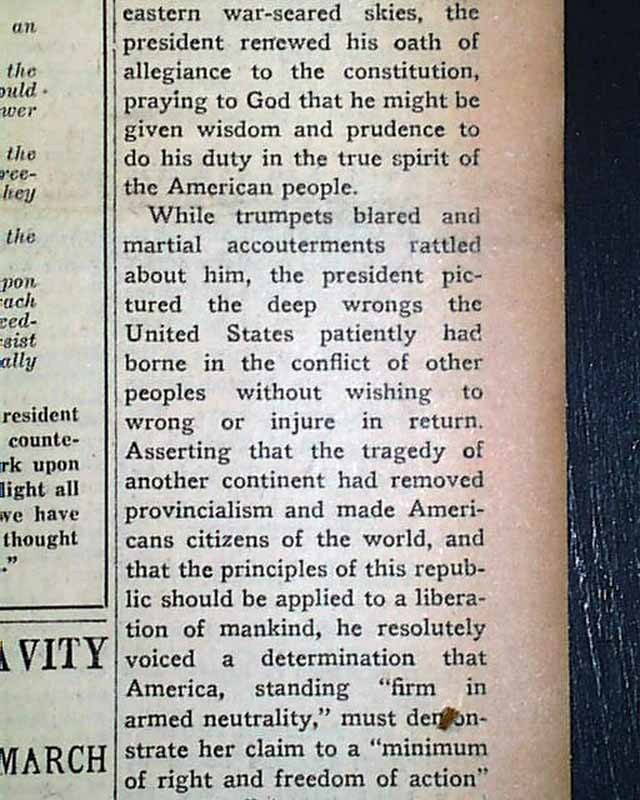 He was the first President to leave the United States while still in office, going to Paris in 1919 to create the League of Nations and shape the Treaty of Versailles, with special attention on creating new nations out of defunct empires. Largely for his efforts to form the League, he was awarded the Nobel Peace Prize in 1919. 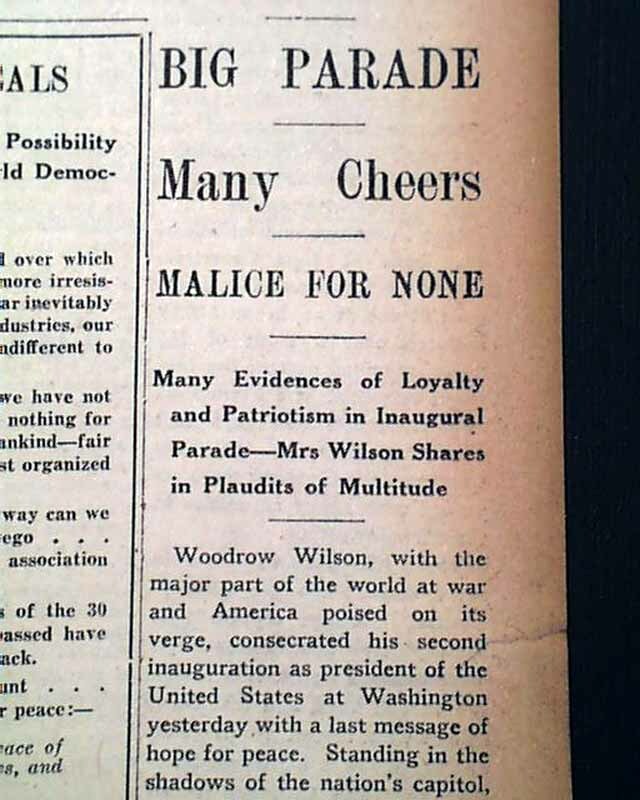 Wilson collapsed with a debilitating stroke in 1919, as the home front saw massive strikes and race riots, and wartime prosperity turn into postwar depression. He refused to compromise with the Republicans who controlled Congress after 1918, effectively destroying any chance for ratification of the Versailles Treaty. The League of Nations was established anyway, but the United States never joined. 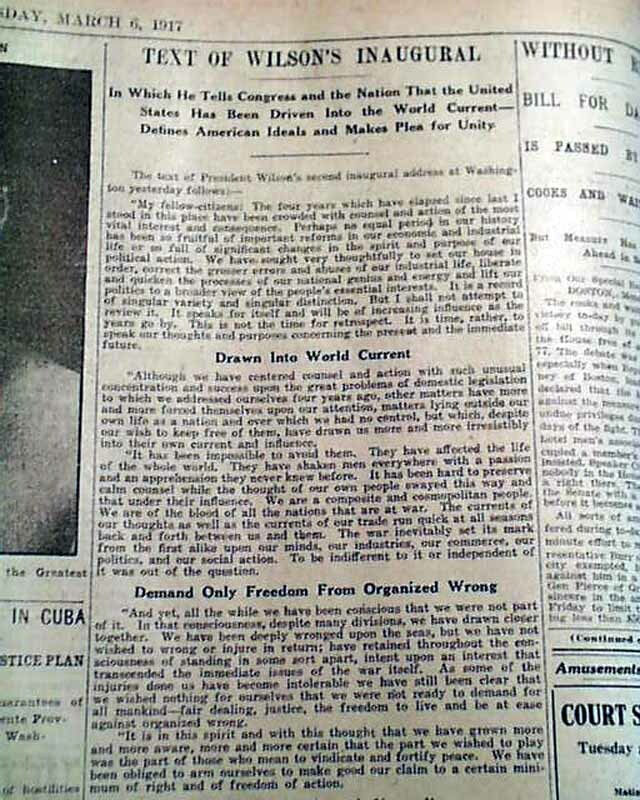 Wilson's idealistic internationalism, calling for the United States to enter the world arena to fight for democracy, progressiveness, and liberalism, has been a highly controversial position in American foreign policy, serving as a model for "idealists" to emulate or "realists" to reject for the following century.